Veteran stand-up comic Marc Maron has been performing his emotionally raw comedy for almost 20 years.He’s hosted radio shows, recorded comedy specials for HBO and Comedy Central, and appeared on Conan O’Brien’s show more than any other comedian. These days, Maron is best known for his popular “WTF” podcast, in which he interviews fellow comics in the garage studio of his Los Angeles home. The twice-weekly “WTF” – which stands for what you think it stands for – has become a show business phenomenon. Over the course of 350 episodes and counting, Maron has elicited surprisingly candid conversation from guests like Chris Rock, Louis C.K., Robin Williams, John Hamm and Sarah Silverman. Returning to North Carolina for the first time in 15 years, Maron performs Friday and Saturday at Goodnights Comedy Club in Raleigh. He recently spoke by phone from L.A. about the podcast, his upcoming TV show on IFC, and the art of conversation. Q: You’ve recently started bringing in musicians like Jack White and Fiona Apple to the podcast. Is that a deliberate plan to broaden the scope of the show? A: Well, there are different types of “WTF” interviews. The more emotional and cathartic interviews with comics, that’s become sort of the “WTF” brand. But if I can get the conversation to be genuine and really happening, I’m not that hung up on what’s being talked about. I can roll with whatever’s going down. I’ve become a good listener. Q: Of all the people you’ve had on the show, are there any that really surprised you as being different than what you expected? A: Oh, it happens all the time. The ones that stand out in my mind are Norm MacDonald and Steven Wright. People who have a very specific public persona, but you’ve never really heard them just talk. Q: There are some great moments in the Steven Wright episode where you hear him laugh. I realized, because of his stage persona, I’d never heard that guy laugh. A: Yeah, and I had to make him do it! He would laugh and then he’d pull away from the mic. I’m like, “Stay on the mic!” He was laughing a lot. What a great guy. Sweet guy. Q: IFC is going to debut your new TV show this year. What’s the status of that? A: We’re almost done with the editing of the 10 episodes we shot. It’s a half-hour scripted show based on my life, a slightly fictionalized world of a guy who starts doing a podcast. You’ve got people playing themselves and integrating into the narrative. I’m pretty proud of it. Q: You came up doing stand-up in Boston and L.A. Is there a different vibe for you playing clubs down South? A: I don’t have that much experience, really. I recently played Nashville and Louisville. I have a great deal of appreciation for the South, the authenticity of it all. But I don’t know what to expect. I don’t know what the percentage is going to be between my fans and just people out for the night. But that’s the challenge of doing comedy clubs. I’m not a huge act. I still have to show up and do the job of a comedian. For several years now, I’ve held the considered opinion that Jessica Chastain is the single most beautiful creature on the planet. 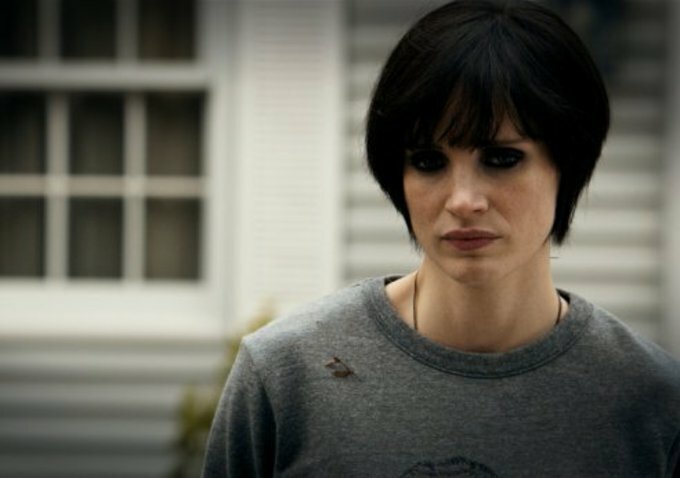 Now I know the truth: Jessica Chastain dressed as a goth rocker is the most beautiful creature on the planet. Chastain’s lovely performance regularly elevates Mama, the very effective new paranormal thriller from producer Guillermo del Toro and first-time director Andrés Muschietti. Fans of del Toro’s previous horror movies (The Devil’s Backbone, Pan’s Labyrinth) will recognize his sensibilities all over this thing. The film opens with a disturbing scene. A distraught father, who has apparently just killed his wife, speeds off in a car with his two little girls. The car crashes and dad leads the kids to a creepy old cabin in the woods. Some very scary things happen, dad doesn’t make it, then we flash forward five years. The girls, now age nine and six, are finally discovered — still in the cabin and living like feral cats. Actually, the way they skitter around on all fours is more insect-like and this is the first of the many, many disquieting images director Muschietti has in store. The girls are eventually adopted by their uncle Lucas (Nikolaj Coster-Waldau, Jaime Lannister to you Game of Thrones fans). Lucas’ girlfriend Annabel (Chastain) isn’t crazy about raising two untamed forest kids. But she becomes more agreeable when the local research institute offers a beautiful rent-free home, in exchange for permission to study the kids. It soon becomes apparent that the little girls have brought a companion with them, a maternal yet decidedly terrifying presence from the other side of the grave. This is Mama. She’s been looking after the kids for years and is none too happy with the new custody situation.